The App Drawer lets you do lots of fun stuff with iPhone messages. The App Drawer allows you to add items that spice up your messages with information from other apps that are installed on your iPhone, as well as drawings and other images from the web. 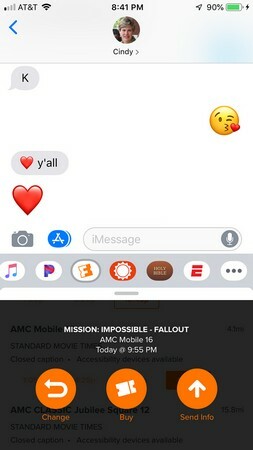 Tap the App Drawer icon (looks like an A) to the left of the iMessage field in your conversation; the App Drawer will display at the bottom of the screen. Tap an item in the App Drawer to see what it offers your messaging. The App Store: Tap the App Store all the way to the left of the App Drawer to find tons of stickers, games, and apps for your messages. Digital Touch: Allows you to send special effects in Messages. These can include sending your heartbeat, sketching a quick picture, or sending a kiss. Other apps you have installed: These may appear if they have the ability to add functions and information to your messages. For example, send the latest scores using ESPN, or let your friend know what the weather’s like nearby using icons from the AccuWeather app. Another example could be using Fandango’s app to send movie information. In the Digital Touch window, tap the gray expansion handle to open the full window. 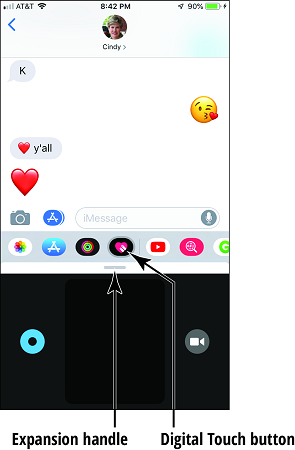 Tap the Information button in the lower-right (a gray circle with a white letter “i”) and you’ll see a list of the gestures and what they do.